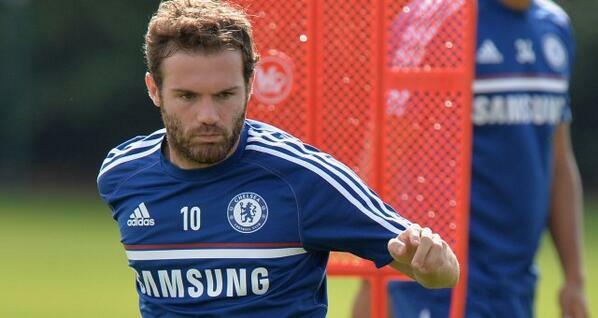 Chelsea Okays United’s Bid fo Juan Mata. Spanish midfielder Juan Mata is set to undergo a medical with Manchester United today (Thursday) ahead of a proposed £37m move from Chelsea. Mata, 25, is expected to pen down a four-and-a-half year deal at Old Trafford. United are believed to be acting through intermediaries in a bid to snap up the former Real Madrid youth player while they continue to deny having tabled a bid for the player. The Old Trafford club boss David Moyes declined to answer questions on Mata following his side’s Capital One Cup semi-final loss to Sunderland on Wednesday. When asked about Mata, the Scot retorted: “We are not saying anything”. Juan Mata Set for Old Trafford Switch. Mata, who joined Chelsea from Valencia for £23.5m in August 2011, said goodbye to teammates and staff at Chelsea’s Cobham training ground on Wednesday and is expected not to return to the club. On completion of the deal, it would break United’s current record transfer of £30.75m paid Tottenham Hotspur in 2008 for Bulgarian Dimitar Berbatov. The Spaniard, who has scored 18 times in 82 league appearances for the club on his way to being voted Chelsea’s official player of the year for the past two seasons, has found it difficult to earn a starting role for himself under Portuguese boss Jose Mourinho. Chelsea insisted Mata was not for sale on Tuesday, but his inability to force his way into Mourinho’s scheme made it difficult for such statement to hold water. Mata has been substituted in nine of his 13 league appearances for the Blues, while playing second fiddle to the likes of Oscar, summer signing Willian and Belgian, Eden Hazard, so far in the ongoing campaign. Calabar Athletic Championships Set to Witness a Stellar Line Up of African Athletes. Previous articleUnited Makes £35m Bid for Chelsea’s Mata. Next articleLi Na to Face Dominika Cibulkova in Australian Open Final.